Well I came back from walking the dogs down the creek path early this morning and look what I found trying to haul its miserable limping cobweb covered self, up my verandah steps. Crying piteously. With all its fluff stuck up on end and such a big sad look. Where did this come from? And no, I am NOT keeping it. I do not do strays. I am NOT a cat person. NO. I told you. I did give it milk and then a wee bit of my breakfast. Well it was staring at me through the screen what was I to do? But I am NOT keeping it. That is quite enough of that talk. Anyway it appears to be a little girl cat and you know how girl cats multiply! No. We are here today to talk about Quiche. Because I really want to share this with you. Quiche is a seasonal dish in that the filling is determined by the gardens. At the moment we have piles of zuchinni and onions. Sometimes I use butternuts and sweet potatoes. Or mushrooms and spinach with feta. I have also made a quiche with feta, avocado and spinach. So use what you have. But with spinach and mushrooms and any wet vegetables make sure you get the excess moisture out first. The Best part of this Quiche is this base. It is so easy and crunchy. have fun with your flavours. Fresh herbs. Today I added rosemary. Mix altogether until it is firm and will form a soft ball. With fingertips pat gently into greased quiche dish covering the base and sides of the dish. Beat 4 or 5 fresh eggs with a little fresh cream or milk. Salt and pepper to taste. Alternate layers of vegetables onto the base. Divide 1 Cup grated tasty/sharp cheese and ½ cup parmesan cheese throughout the layers, leave some for the top. In between layers I added the egg mixture until it was all poured through. Cook for about 50 – 60 minutes until golden brown. Cool in its dish on a cake rack. Perfect for lunch today. And so that is what I am going to do. Have lunch. ← Real Hens Eat Quiche. oWWWWWWWWW!!!!!!!!! You must keep her! She has been reading your blog and wants to come visit for some good home cooking! You are all so bossy. She is sleeping in a little bed on the verandah. We will see. She is not coming inside though that is a slippery slope! jessica, that sam.. so persuasive. It seems to be keeping me AND it eats quiche! Though it has a history. I am ferreting out its origins..
ah but dont you sort of want to keep it? I have to admit that there is a kind of abject sweetness about those little green eyes peering about all wondrous like. 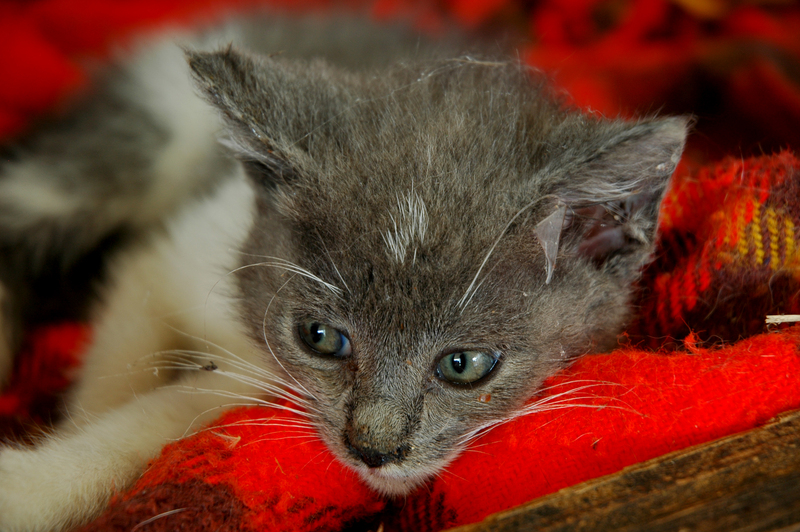 That bedraggled kitten is adorable. I’ll have to keep reading to see what happens to her. You know, they can “fix” them when they’re even smaller than she is. Our no-kill pet shelter has the vet come in in kitten season and do them so they’re ready to be adopted and no worries about increasing cat populations, at least from them. You know we are all going to be persuading you to keep her. 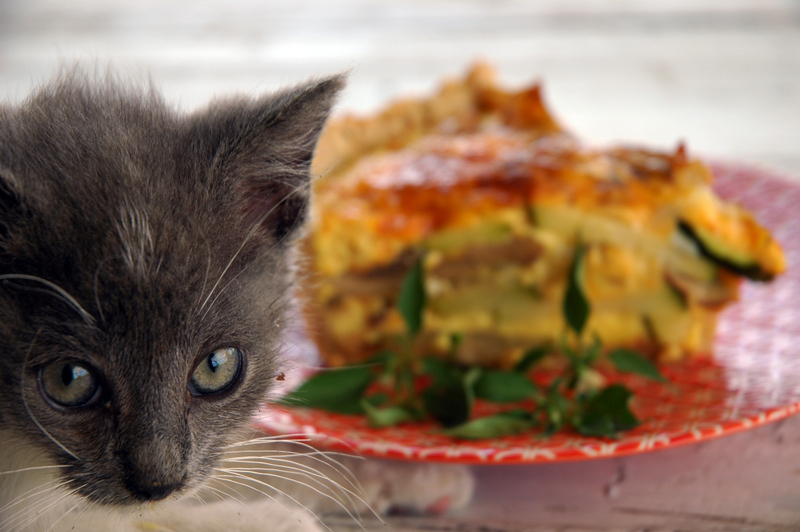 Not sure which is more gorgeous, kitty or the quiche!